If your SatCom provider claims, ‘We have the lowest prices’, odds are they only care about your money. Why else do they offer the lowest price? Sure, it may seem like a great deal initially, but when you or your people are immersed in an after-hours emergency, and you call your lowest priced SatCom provider for help will they answer? Probably not. They didn’t promise you anything other than the lowest price. What is your goal with SatCom? What do you need SatCom to actually do for you? We help you understand the SatCom industry: Why one solution is better for you than another, what each solution does, how the best solution aligns with the results you want, and works within your budget. One of our clients told us that he is responsible for the safety of 120,000 employees. Our CEO, Lou Altman told him that means GlobaFone is also responsible for the safety of 120,000 employees (as far as SatCom is concerned). As a GlobaFone client your challenge is our challenge, your results are our results. We partner with you to tackle the issues you face that SatCom can solve. GlobaFone provide the best value, not lowest price. Big Difference. When you need help, no matter what time of day or day of the week, wouldn’t you prefer to have a SatCom provider that cares about you and not just your money? You need an answer, not a recording asking call back during regular business hours. So many SatCom users are emergency responders, police, fire and military. Their/your office is never closed and neither is ours. 24/7 help for a 24/7 business. Disasters happen anytime, not just during ‘regular business hours’. We’re here to serve you so please contact your favorite GlobaFone team member who will be happy to help you. Call us at 603-433-7232 or e-mail us HERE. Know someone who will benefit from this message and information? Please feel free to forward this message to them so we can help them as well. The highest compliment we can receive is a referral and we thank you for sharing our message. What Do They Respect About You? Respect. What does it mean to you? Seems about right. We respect policemen and women, firefighters and military service members because of their selflessness and courage. We may respect wealthy people because of their financial success or philanthropy or paradigm-shifting vision. We respect schoolteachers because of their commitment to our children. We can go on and on with who we respect and why we respect them. I was volunteering at a competition recently where the rules state that there is no running. It seemed the more we asked the kids (15-18 year old) to stop running, the more they did, in fact at one point, upwards of 100 of them ran full speed in full view of our administration team. One of the staff commented about how disrespectful that was. By contrast a segment of the kids voted to award me the safety star for my relentless announcements about the no running rule and a dozen or so asked for my autograph, most on their running shoes. On the flight home the woman next to me spent the entire taxi and take-off on her phone, scrolling through Facebook. Taxi and take-off – you know, the time when we are asked to have our phones in airplane mode or off. What life-altering post could not wait the two hours? I mean, it’s Facebook. I am not always a strict rule-follower, but I comply with this request, unless it is something really urgent. And I cannot even remember the last time that happened. Then, as the harried, flight attendant serving meals, literally juggling trays, she asked for a vodka/tonic. And we were to be served next! It couldn’t wait five minutes until the poor woman was finished serving others and it was ‘our time’? Maybe I’m hypersensitive, or just something about this woman bugged me, but I found her behavior disrespectful. That got me thinking to the SatCom space – does this translate over to satellite phone providers? I say it does. Lowest cost providers are lowest-cost providers because all they respect is money. That means their decisions are financially-based and they attract like-minded customers – the ‘cheapest is best’ crowd. Lowest cost providers push products, cut pricing whenever there is an objection and cannot or will not provide much or any help after the sale, unless they absolutely must. They don’t care about YOU and your challenges and desired results, they just want your money. Compare this to quality providers that respect your time, knowledge, staff, location, problems, and desired results. We want you to understand the solution we present so we preface the solution by taking the time to talk with you, educate you, learn about you, your organization and your goals. Only after doing this will we help you choose the proper solution for you, not merely the solution with the highest profit. By the way, this dynamic means you will have a provider that is worthy of your business and if they are really good, you won’t ever want to change. Quality providers understand this and they work hard to earn, and keep your trust. There are many providers who claim the lowest prices AND best service. Beware of them; that duo cannot exist. If you have the lowest prices, you only care about selling, not serving. And if you are serving, there is small additional cost added for that knowledge, industry insight, education, extra effort, and after-hours calls. 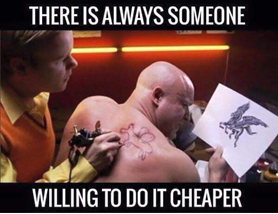 That kind of support and help is not free, so if you are willing to be fully respected, choose a provider that doesn’t boast about low prices. Choose a provider that will fully support you all the way from the prospecting call to that urgent ‘has-to-be-here-tomorrow’ order to that critical, potentially life-saving 2:00 AM emergency support call. You don’t want to over pay for SatCom and that criteria will be based on the value you feel you receive. When you over pay, you lose a little bit of money. By contrast underpaying is far more expensive, especially with SatCom where lives can be at risk. There are many SatCom providers that will respect your time, energy, responsibilities and your budget. Choose one of these providers. They respect YOU.